It was only last week that I heard of the Bakers Delight homemade pizza competition, celebrating the release of their new fresh (additive and preservative free) pizza base range. 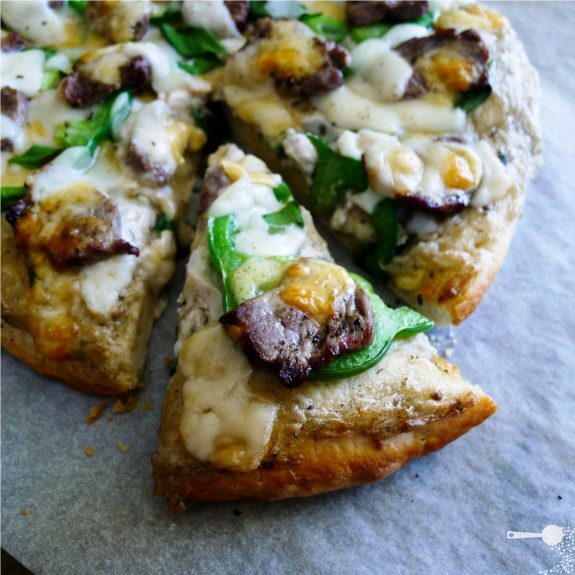 Being away from my kitchen on the weekend hasn’t really helped my chances – the competition closes in 2 days, but depsite this, I have decided to make a dash for the last minute entry with my Philly cheesesteak pizza. I have also decided that should my pizza win, I will donate at least half of the money to a charity or community organisation in need – I will blog about it to say thanks for your support and prove that I have kept true to my word. So please be generous with your votes. Please vote for my pizza here – the pizza with the most Facebook likes wins! Voting closes 11:59pm AEST 20 July. So what exactly is a Philly cheesesteak pizza? As the name suggests, the idea of a cheesesteak topping originated in Philadelphia and is now to Pennsylviania what Lady Liberty is to New York – an undisputed icon. You can read the full history of the cheesesteak here. It is therefore no coincidence that I first tried this lovely concoction at a cookout [barbecue] in Scranton, Pensylvania – yes, it is the town where the US version of The Office is shot. I will never forget the taste of tender well-seasoned steak strips dotted around a medium pan base, smothered in melting lightly sharp provolone cheese. I like veges on my pizza, but for once I didn’t mind lack thereof. It was a taste sensation like none before. It was love at first bite. When I first saw the new range of Bakers Delight fluffy pizza bases, I was finally content I’ve found the perfect base for the cheesesteak topping. So after sitting in the car for 6 hours on our return trip from the snow yesterday, I ducked into our local Bakers Delight, grabbed a couple of bases (2 for $4) and got cooking. While I didn’t mind the lack of vegetables on the original Philly cheesesteak, I couldn’t resist but to add a few: eggplant dip as a base, spring onions and green capsicum in the topping. Barbecue sauce to top is nice but optional. To prepare bases: slice capsicum into thin rings and chop sping onions. Divide eggplant dip between the 2 bases and spread to the edges. Sprinkle with spring onions and top with capsicum slices. To prepare the cheesesteak topping: dot a quarter of the provolone and smoked cheddar slices around the prepared pizzas. Slice beef fillet steaks into thin strips (like for a stir-fry). Season with salt and pepper. Heat a lightly greased pan, griddle or wok on medium. Sear beef in batches for 5 seconds on each side and place onto pizza bases. Dot with leftover cheese. Bake in the oven for 10 minutes or until the cheese is nicely melted and base crisp. Serve immediately with an optional drizzle of barbecue sauce. Wow, I had no idea about Baker’s Delight pizza bases. I need to get out more. I always make my own but if these are good it saves time! I’ll go check out the voting and good luck. Pizza looks delicious! If you like Baker’s Delight on Facebook now you can pick up 2 bases for free when you purchase their lovely sourdough vienna! Yum….looks really tasty! I did have a Philly Cheese Steak Sambo in Hawaii earlier in the year…some vege’s wouldn’t have gone astray. LOL. I just had pizza yesterday and now I want it again. Looks seriously good! oh my god that looks amazing!!! maybe after I’ve stabilized my healthy living plan I can indulge in one of these on a rainy day. It has capsicum on it…? Seriously though, best to eat in moderation and not tempt yourself like this during a change of habits phase. I hear you’re going well – happy for you! Such a good looking pizza- too bad we can’t taste images because you have made us all very hungry. Glad you liked the bases too! Thanks! I’m going to make the best of the coupon and pick up my favorite sourdough and pizza base combo today! The bases are great – cheap and wholesome 🙂 perfect really. Nice take on a cheese steak!